Switzerland is one of the main targets of the Retefe banking trojan since its first appearance in November 2013. At that time, it changed the local DNS resolver on the computer (See also blog post “Retefe Bankentrojaner” in German only). Almost a year went by until they changed to the still current approach of setting a proxy auto-config (PAC) URL (See also blog post “The Retefe banking Trojan has targeted Switzerland“). 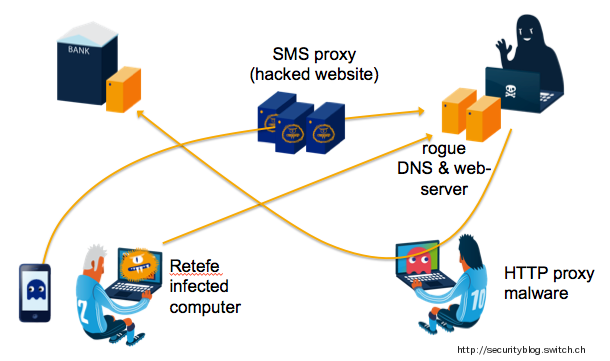 To understand the story of this blog post, it helps to understand the modus operandi of the Retefe malware. We recommend you read up on it on our blog links posted above if you are not familiar with it. While the Retefe actors are constantly changing tactics, for example their newest campaigns also target Mac OS X users, their malware still works the same. One of notable changes was the introduction of Tor in 2016. At first, they started using Tor gateway domain names such as onion.to, onion.link within the proxy auto-config URLs, later on they switched to Tor completely. The advantage of using Tor is of course, anonymity and the difficulty to block or take down the infrastructure. Onion domain names don’t use DNS or do they? The Tor network can use .onion domain names but these names are not resolved over DNS but instead work only in the Tor network. RFC 7686 (The “.onion” Special-Use Domain Name) goes into more details on the special case of .onion domain names. However, the fact is that .onion domain names do leak into the DNS system. For potential reasons and more information on this subject we recommend the paper by Versign Labs “Measuring the Leakage of Onion at the Root” (PDF). Categories: Malware | Tags: DNS, Malware, Retefe, Tor, Trojan | Permalink. A few months ago, we blogged about the banking trojan Retefe (Blog post in German) that was and still is targeting Switzerland. First off, Retefe is different because it only targets Switzerland, Austria and Sweden (and sometimes Japan). Contrast this to many other banking Trojans, which have a much more global and dynamic target list. Not only that, but the Retefe infrastructure also prevents computers from not affected countries to connect to its systems by using geo-location aware access lists and filters. The second unique property of Retefe is the fact, that it only modifies the operating system by adding a fake root certificate and by changing the DNS server for domain name resolution. After infection, the installer removes itself, which makes life hard for anti-virus software trying to detect a malicious Retefe component or activity. Since a few days, Retefe is back again with a new twist. It still targets the same countries and the same banks. Not too exciting, the spam campaign has changed. However, in this wave Retefe is picky and only installs itself on selected computers. And some icing to the cake, it also installs another malware called DOFOIL. In this blog post, we give a technical analysis of the new Retefe. Categories: E-Banking, Malware | Tags: Bankentrojaner, E-Banking, Malware, Retefe | Permalink. E-Banking ist seit seiner Entstehung ein attraktives Tummelfeld für Betrüger. Oft wird auf spezielle Schadsoftware, auf sogenannte Bankentrojaner, zurückgegriffen, um arglosen Opfern Geld abzuziehen. Die meisten dieser Bankentrojaner basieren auf technisch betrachtet ziemlich komplexen Softwarekomponenten: Verschlüsselte Konfigurationen, Man-in-the-Browser-Funktionalität, Persistenz- und Updatemechanismen, um einige zu nennen. Im letzten halben Jahr hat sich eine gänzlich neue Variante behauptet, welche erst im Februar 2014 einen Namen erhielt: Retefe. Nur wenig wurde bis an hin publiziert, einer der Hauptgründe ist sicherlich, dass die Schadsoftware nur in wenigen Ländern (CH, AT, SE, JP) agiert und nur einige ausgewählte Banken angreift. TrendMicro (Blogartikel: Operation Emmental (DE), (EN)) und SWITCH-CERT möchten hiermit nun etwas detaillierter über diesen Trojaner berichten. Auf dem PC des Opfers wird der Eintrag des DNS-Servers auf einen bösartigen DNS-Server geändert. Auf dem PC des Opfers wird ein gefälschtes Root-Zertifikat installiert, siehe auch unser kürzlich veröffentlichten Blogartikel zu diesem Thema. Nach der Infektion löscht sich die Installationsroutine selbst. Ausser dem manipulierten System bleibt nichts zurück, was es schwierig für Antiviren-Programme macht, im Nachhinein eine Infektion festzustellen. An Eleganz ist diese Schadsoftware schwer zu übertreffen: Sie verzichtet auf die in der Einführung genannten Softwarekomponenten und minimiert damit die Komplexität. Es scheint auch, dass es aus Betrügersicht heutzutage ökonomischer ist, schlicht und einfach neue Opfer-PCs mittels Spam-Kampagnen zu infizieren. Wie sieht der Modus Operandi konkret aus?